For interior designers and their clients, there’s nothing like seeing furniture and decorative accents in a real home. 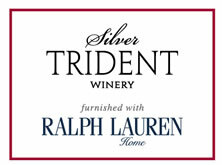 That’s the idea we bring to life at the Silver Trident Winery Tasting Home furnished with Ralph Lauren Home. Equal parts gracious home, tasting room and interior design showroom, we're your full service solution for all your Ralph Lauren Home needs—from furniture and lighting to floor coverings and accessories. As a member of ASID, we are pleased to offer full trade recognition to professional designers on all purchases from the Ralph Lauren Home collection. As the first fashion designer to present an all-encompassing collection for the home, Ralph Lauren introduced a distinctive vision and unwavering commitment to craftsmanship that has enriched the places we call home. We offer an elegant and inspiring private space where you can meet with your clients to review all the elements of the Ralph Lauren Home collection. We are a full Ralph Lauren Home resource library complete with on site catalogues, samples of fabrics, wall coverings, leather and wood finishes. Silver Trident Winery represents the entire Ralph Lauren Home collection and can customize orders based on your design needs and preferences. Our comprehensive collection of Ralph Lauren Home furniture, fabrics, lighting, floor coverings and artwork offers designers, and their clients, inspiration for creating one of a kind furnishings and complete home décor—all in a welcoming private workspace. It’s truly an inegrated service solution for the design professional. The unique Ralph Lauren Home pieces on display at the Silver Trident showroom are available as are classic Ralph Lauren accessories to accent final styling touches. We’re here seven days a week to satisfy your needs and those of your clients—from white-glove delivery and installation to custom design and upholstery, distinctive lighting, or simply instant gratification.